Skip bin hire at Greenhills Beach is the best option for you when working through ways to get rid of your rubbish. At Greenhills Beach, an affordable skip bin is never far away. We are a family-owned business, and we live right here in the Shire with you. This gives us a unique insight into the area and what will work best when hiring your skip, and no extra travelling fees. A skip bin at your property allows you the easy option of stacking and storing your rubbish safely and efficiently as you work through the mess. Keeping the house or job site clean and safe and allowing time for you to methodically reach your goals makes this part of the project stress free. Our long term business relationships with local tipping facilities allows us to pass on better prices and do the dirty tip driving and unloading for you. 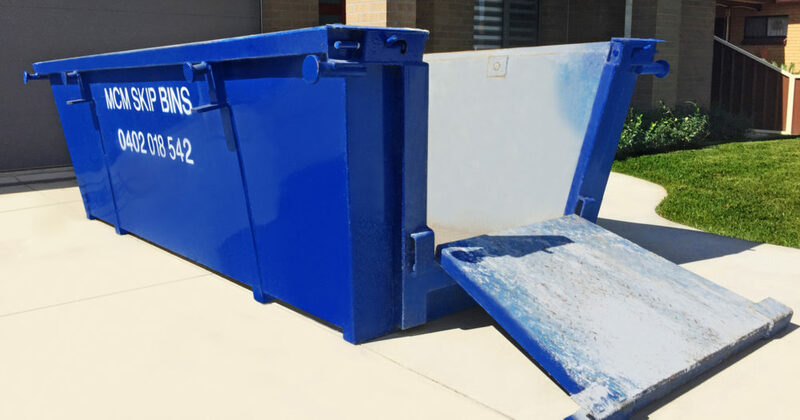 MCM Skip Bins uses its years of experience to make getting rid of your rubbish at Greenhills Beach efficient and effective and all at a great price. We don’t want you to pay for what you do not need. We know all the right questions to ask to help you sort our what size bin you will need, timing for your job and placement of the skip bin for easy loading. You might be the homeowner cleaning-up, moving in or landscaping. You may be the builder or a trade looking for efficient and effective skip bins are great prices. Our range of marrell and hook lift bins with rear doors come in 3, 4, 6 and 8 cubic metres. This range of bin sizes caters for all needs and budgets. Builders and other trades need reliable service with guaranteed drop off and pick up times. You can count on our clear communication and understanding of how job sites work, access issues and keeping other trades and your customer happy too. Greenhills Beach is a brand new Sydney beachside suburb about 26km south of the CBD. The homes at Greenhills Beach front onto the breathtaking surf beaches of Cronulla in the Sutherland Shire. Patrolled Beaches at Wanda, Elouera, North and South Cronulla see swimmers, surfers, boarders and the like all year round. MCM Skip Bins is a proud partner of the residents, builders and trades that work hard to transform the ever-changing streets of the thriving Greenhills Beach. For over 15 years we have been providing top end service at great prices for skip bin hire in the area for all homes, units and shops and are now a proud partner of the new Greenhills beach development. Greenhills Beach showcases the latest in architecture and design of multistorey homes. These glamorous homes not only front onto amazing beaches but are surrounded by a well established community offering great schools like Cronulla High School and Cronulla Primary School. The area comes with a passionately supported rugby league team in the Cronulla-Sutherland Sharks. Many children follow in the footstep of the players joining De La Salle Junior Rugby League or Cronulla Caringbah Junior Rugby League Club. Hockey and soccer fields are at the door step of Greenhills Beach residents. Our trucks are always buzzing around the streets of Greenhills Beach whisking away unwanted rubbish and waste from new builds, movers and the like. We enjoy our customers here and look forward to many years of working together building the community at Greenhills Beach.